Is there proof that giants once lived and raised families in North America? Stories and newspaper accounts attest to amazing discoveries of huge elaborate caves and mines, gold spears and polished granite inscribed with mystical symbols. Witnesses have reported their discoveries to the Smithsonian Institute and have been promised compensation. Yet, the Smithsonian, archaeologists and other scientists are silent as to the discoveries and have hidden all evidence that is contrary to Darwinian theory of evolution. 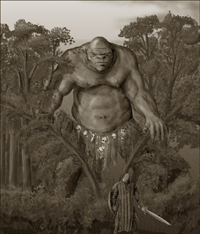 The following are actual accounts of giants in North America. "Atlantis in the Colorado River Desert" - 1947 Nevada news: Near the Nevada - California - Arizona border area, 32 caves within a 180 square mile area were discovered to hold the remains of ancient, strangely costumed 8 -9 foot giants. They had been laid to rest wearing the skins of unknown animals similar to sheepskins fashioned into jackets with pants described as "prehistoric Zoot- suits". The same burial place had been found 10 - 15 years earlier by another man who made a deal with the Smithsonian. The evidence of his find was stolen and covered up by Darwinian scientists. Dr. F. Bruce Russell had come to Death Valley from the east coast. He had taken up mining in the west for the sake of his health and was exploring across the Colorado River into Arizona. What he found he described as the burial place of a tribal hierarchy within the ritual hall of an ancient people. He felt that some unknown catastrophe had driven them into these caves. All of the implements of their civilization were there, including household utensils and stoves. Dr. Russell reported seeing hieroglyphics chiseled on carefully polished granite within what appeared to be a cavern temple. Another cave led to their sacred hall which contained carvings of ritual devices and markings similar to those of the Masonic Order. A long tunnel from this temple led to a room where, Hill said, "Well-preserved remains of dinosaurs, saber-toothed tigers, imperial elephants, and other extinct beasts were paired off in niches as if on display." Ten to fifteen years earlier the caves had been seen by another miner who had fallen from the bottom of a mineshaft. In his book, "Death Valley Men", Bourke Lee related a conversation among residents of Death Valley concerning the local Paiute Native American legends of an underground city at Wingate Pass. After falling through the ceiling of an unknown tunnel, the miner had followed it 20 miles north of the Panamint Mountains to discover a huge ancient underground city. He saw arching stone vaults with huge stone doors and a polished round table in the center of their council chamber which had once been lit by ingenious lights fueled by subterranean gases. Leaning against the walls were their tall gold spears. He said that the designs on their thick golden armbands resembled the work of the Egyptians. The tunnel ended at an exit overlooking Furnace Creek Ranch in California's Imperial Valley. He could see from there that the valley had once been underwater. The tunnel entrance had been a dock or a quay located halfway up the side of the mountain. A deal was made with the Smithsonian museum for the find, but the miner was betrayed by his partner. The evidence was stolen and the entrance concealed. In a 1940 a mining journal, another find was reported of much worked gold found in an 8 mile long cave near San Bernadino. University of Arizona professor Vine Deloria, himself a Native American, made a similar accusation against the Smithsonian for covering up the remains found within the burial mounds of the Moundbuilder civilization. Surviving diaries from before the time Darwin attest to these discoveries. The Moundbuilders were a different civilization than that of the Indians, they said. The mounds contained the remains of hundreds of giants along with the bones of giant mastodons. In Cincinnati, Ohio the giant bones were found with large shields, swords, and engraved stone tablets. In Kentucky and Tennessee the bones of "powerful men of towering stature" were excavated. One of these 7 foot men was buried with an engraved copper plate beneath his head. A woman was also found. She was wearing a silver girdle with letters written on it. The Detroit Free Press reported in 1884 the discovery in Gartersville, Mississippi of the remains of a giant with waist-length jet-black hair. He was wearing a copper crown. With him in his timber burial vault were his children who wore garments decorated with bone beads. The tomb was covered with large flagstones engraved with inscriptions. In Cayuga, Niagra there is a place called "The Cemetary of the Giants" which was discovered in 1880. Those giants were 9 feet tall and appear to have died violent deaths. Their axes were found with them. Giant bones were also unearthed from a rock fissure on Lake Erie Island. In some of the finds of giant bones, the bones lay in confusion as if left on a battlefield. The Smithsonian does display some artifacts of the Moundbuilders found with the bones of the giants - shell discs and carved stone beads. Many of the bones turned to powdery ash within a short time of being exposed to the air. The Smithsonian has been reluctant to test some less fragile finds. The late Vine Deloria said that it is because they "Mightent find a really early date for the bones" and that it would be distressing - distressing to their Darwinian time-line.